Phi Beta Kappa Exercises, at 11, with poet and novelist Laura Kasischke and orator Allen Counter, director of The Harvard Foundation for Intercultural and Race Relations and professor of neurology. Sanders Theatre. Baccalaureate Service for the Class of 2015, at 2, Memorial Church, followed by class photo, Widener steps. Class of 2015 Family Reception, at 5:30. Tickets required. Science Center plaza. Harvard Extension School Annual Commencement Banquet, at 6. Tickets required. Annenberg Hall. ROTC Commissioning Ceremony, at 11:30, with President Faust and guest speaker General David G. Perkins, commanding general of the U.S. Army Training and Doctrine Command. Tercentenary Theatre. Harvard Kennedy School Commencement Address, at 2, by David Miliband, president and CEO of the International Rescue Committee. JFK Park. Senior Class Day Exercises, at 2, with the Harvard and Ivy Orations and a guest speaker, to be announced. Tickets required. Tercentenary Theatre. Law School Class Day, 2:30, featuring former U.S. Representative from Arizona Gabrielle Giffords and her husband, Mark Kelly, a retired U.S. Navy pilot and NASA astronaut. Holmes Field. Business School Class Day Ceremony, 2:30, with Intuit co-founder and chairman Scott Cook, M.B.A. ’76. Baker Lawn. Graduate School of Design Class Day, at 4, with a guest speaker. Gund Hall lawn. Harvard T.H. Chan School of Public Health Award Ceremony, 4-7. Kresge Courtyard. Graduate School of Education Convocation, 3-5, with a guest speaker. Radcliffe Yard. Divinity School Multireligious Service of Thanksgiving at 4. Memorial Church. Graduate School of Arts and Sciences Dudley House Masters’ Reception, 4-6. Masters’ Receptions for seniors and guests, at 5. The Undergraduate Houses. Harvard University Band, Harvard Glee Club, and Radcliffe Choral Society Concert, at 8. Tercentenary Theatre. Commencement Day. Gates open at 6:45. Academic Procession, 8:50. The Old Yard. The 364th Commencement Exercises, 9:45 (concluding at 11:45). Tickets required. Tercentenary Theatre. All Alumni Spread, 11:30. Tickets required. The Old Yard. The Tree Spread, for the College classes through 1964, 11:30. Tickets required. Holden Quadrangle. Graduate School Diploma Ceremonies, from 11:30 (time varies by school). GSAS Luncheon and Reception, 11:30 to 3. Tickets required. Behind Perkins Hall. College Diploma Presentation Ceremonies and Luncheons, at noon. The Undergraduate Houses. Alumni Procession, 1:45. The Old Yard. The Annual Meeting of the Harvard Alumni Association (HAA), 2:30, includes remarks by HAA president Cynthia A. Torres ’80, M.B.A. ’84, President Faust, and Commencement speaker Deval L. Patrick; Overseer and HAA director election results; and Harvard Medal presentations. Tercentenary Theatre. Harvard T.H. Chan School of Public Health Diploma Ceremony at 2, with guest speaker Donald R. Hopkins, M.P.H. ’70, Sc.D. ’13, vice president of health programs of The Carter Center. Kresge Courtyard. Medical and Dental Schools Class Day Ceremony. Ticketed luncheon at noon, followed by a speech, at 2, by Rajesh Panjabi, co-founder and CEO of Last Mile Health; associate physician, division of global health equity, at Brigham and Women’s Hospital; and HMS instructor in medicine. Radcliffe Day, celebrating the institution’s past, present, and future, includes a morning panel discussion followed by a luncheon honoring the 2015 Radcliffe Medal recipient, Ruth Bader Ginsburg, L ’59, LL.D. ’11, associate justice of the U.S. Supreme Court. The discussion, “A Decade of Decisions and Dissents: The Roberts Court, from 2005 to Today” (10:30 a.m.-noon), is moderated by Margaret H. Marshall, Ed.M. ’69, former chief justice of the Supreme Judicial Court of Massachusetts and a senior research fellow and lecturer on law at Harvard Law School. Panelists include: Linda Greenhouse ’68, Knight distinguished journalist-in-residence and Goldstein lecturer in law at Yale Law School; Lauren Sudeall Lucas, J.D. ’05, assistant professor of law at Georgia State University College of Law; and, from Harvard Law School (HLS), Kirkland and Ellis professor Michael Klarman and Bromley professor John Manning. The luncheon, 12:30-2, will feature remarks by retired Supreme Court associate justice David H. Souter ’61, LL.B. ’66, LL.D. ’10; then, former HLS professor and former dean of Stanford Law School Kathleen M. Sullivan, J.D. ’81, will talk with Justice Ginsburg about her career. Tickets for the day’s events have already been distributed; no walk-in attendees will be admitted. The events will be webcast live at www.radcliffe.harvard.edu . 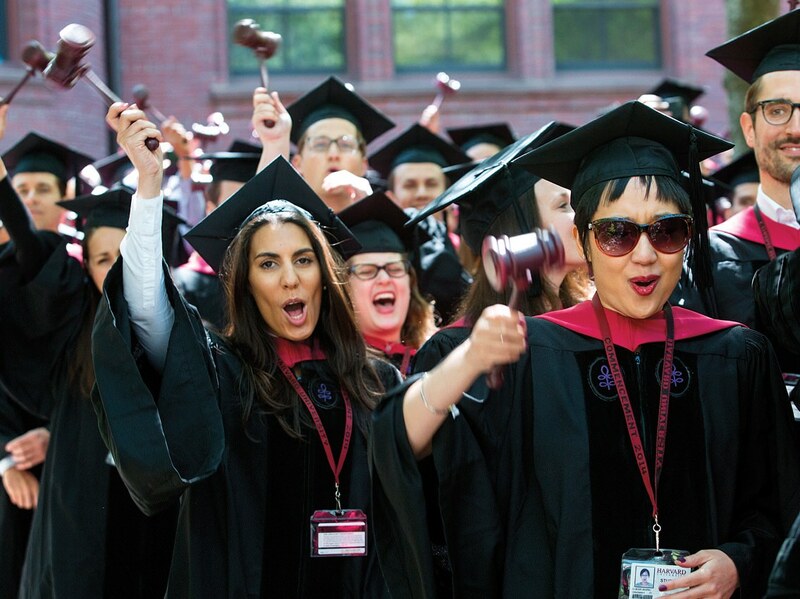 For other Commencement week schedule updates, visit http://commencement.harvard.edu/events-schedule , or http://alumni.harvard.edu/annualmeeting . The Smith Campus Center is open daily, 9 to 5 (617-495-1573), except Sunday.